If you're looking for the best Bluetooth speaker for really good audio indoors then we have the cure for your wireless blues. Whatever their shape, price or appearance, all of these Bluetooth speakers are here primarily on the basis of their sound quality and suitability for use at home. Bluetooth is a wonderfully easy and versatile way to stream music, and after years of honing and improvement, the best Bluetooth speakers can sound excellent – especially when they also utilise sound quality improving technologies such as aptX, aptX HD, AAC and/or Wi-Fi, so you can stream from your device or the cloud, in higher resolution. Are AAC, aptX, aptX HD and Wi-Fi better than basic Bluetooth? Our current overall favourite Bluetooth speaker is the Audio Pro Addon C3. This has the classic characteristics of a wireless speaker, being small, portable, battery-powered and easy to use. However it adds some very handy additional functionality, with support for AirPlay, Spotify Connect, numerous streaming services, web radio and even multi-room. It also looks and sounds stunning. It's the complete package. If you want a speaker that sounds and looks good enough to use in the home but which can go absolutely anywhere the UE Megaboom 3 is the only game in town. It's totally waterproof (it even floats), very rugged, loud and boisterous, but audio is still good enough for home use, so long as you mainly like pop and partying, as opposed to string quartets. Are Bluetooth and wireless the same thing? No. All Bluetooth speakers are wireless but not all wireless speakers rely on Bluetooth, although most include it. This is going to become more of an issue as wireless speaker technology evolves. A lot of the best recent 'Bluetooth' speakers also feature Wi-Fi streaming from your phone or direct from the cloud for services such as Tidal, Spotify and Apple Music. Others include Alexa voice control, which can let you summon music from Spotify, Apple Music, Deezer and others. You need to be subscribed to these services, of course. A great example of this is the Audio Pro C3 that is #1 in this very list. Bluetooth also turns up as an option on speakers that are really meant to be used with Wi-Fi or an analogue or digital, wired input – Bowers & Wilkins' Zeppelin, Naim's Mu-so family and so on. However, since far more people search for 'Bluetooth speaker' than 'wireless speaker' we're going to continue to call it that. There are Bluetooth speakers that are more like updates to the old hi-fi mini systems – you plug them in, they're mainly for streaming but have a line in, and the emphasis is on superior sound quality. Then there are your classic portable Bluetooth speakers with battery power and go-anywhere convenience. The Audio Pro Addon C3 however – and a number of the other Bluetooth speakers listed here – are a hybrid of the two. The C3 looks extremely stylish, sounds superb but is very petite, has a natty carry handle, and nine hours of battery life. It also piles on AirPlay and Spotify Connect via Wi-Fi, as well as Audio Pro's own app, so you can even use it as part of a very chic multi-room setup. There's a line in as well. Audio Pro's app is a bit woolly, but you don't actually need to use it other than for multi-room control. Actually if you use AirPlay from a laptop, you could bypass it entirely and still have multi-room. Although one thing you should definitely use the app for is to set up the 5 preset buttons on the front of the C3 – these then give instant access to your favourite web radio stations or Spotify playlists. Slightly surprisingly there's no support for the audio-improving Apt-X (Android) or AAC (iOS) codecs. However music played via Bluetooth still sounds excellent. 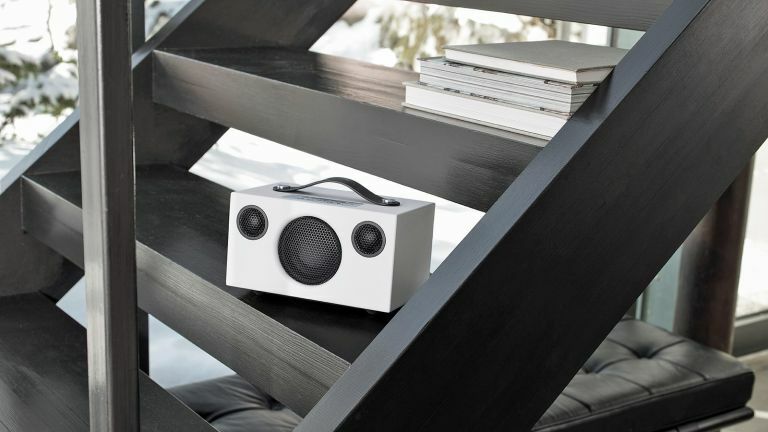 This isn't a cheap box for playing pop music in the park – although it will do that, so long as you keep it dry – it's a very musical, high quality speaker that happens to use Bluetooth. What you've got here is a super-portable speaker with Wi-Fi streaming for higher quality and multi-room, with Bluetooth for total convenience. It's a stunner. The Megaboom 3 is right at the opposite end of the portable speaker spectrum from Audio Pro's list-topper. It's fully focussed on the outdoors, being waterproof and very rugged. Actually it's not just waterproof – it even floats, so if it's accidentally (or deliberately) dropped in the pool, it's easily retrieved. Unlike the Addon C3, the Megaboom 3 probably won't win approving nods from audiophiles but while it may be targeted at those who want dance, pop and rock tunes in the outdoors, its small footprint and attractive design mean it can function perfectly happily in the kitchen. The cooly muted colours it comes in are, in fact, about the only quiet things about it. Ultimate Ears has absolutely piled on the bonus features here, with the ability to pair two in stereo as well as the option to chain anything up to 'hundreds' of them (!) for even greater volume. A 'magic button' on top lets you easily play, pause and skip tracks and, uh, not-so-easily control playlists. It's cool that UE has added this functionality but it has two problems: it only works with Apple Music and Deezer playlists, and you can only skip forwards through your playlists, one at a time. So if you have hundreds of playlists, this could be of rather limited use (or at least, you'll get RSI skipping to the one you want). With 20 hours of battery life, impressive bass and volume, 360º sound, and build quality that renders it essentially unkillable, the UE Megaboom is by far the best outdoor speaker you can get. And as noted, you don't need to wait for summer to come back to enjoy it, as it does work well (for pop music in particular) in the kitchen, bedroom or elsewhere. • If you want a very similar speaker with Alexa built in, as on an Amazon Echo device, UE also does the superb Megablast. This doesn't float but it it waterproof and does let you control Amazon and Spotify playlists and choons with the power of your voice (and Alexa). In our brave new world of one-box, wire-free audio solutions it's easy to forget that music is still generally recorded in stereo. A lot of wireless speakers make a decent fist of giving a wide 'sound field' (apologies for the use of a term redolent of too many nights spent listening to Yes whilst overly relaxed, there) but Cambridge Audio's splendid YoYo M doesn't have to try too hard, because it's a pair of stereo speakers. You can use just one of them if you like, but that's a bit like buying a pair of chopsticks and only employing one. Fire them both up, by pressing the Pair button on the second unit and you get a brilliantly big, w-i-d-e, musical performance. The only problem is, you have to do that every time you use the YoYo M, which is a bit irritating, for the reason mentioned above – there's no reason to buy a pair of speakers if you only intend to use one, so why can't you turn them both on with one button? No doubt some nonsense to do with, "You can't do that via Bluetooth, so you'd have to use a wire and then they wouldn't be wireless, you idiot." I dare say. However, I do wish Cambridge had 'cheated' and wired the pair together. This would also mean fewer drop-outs when something gets in the way of the transmission of sound between the speakers. That aside, the YoYo M is a superb (pair of) Bluetooth speaker(s). It's devilishly handsome to boot, dolled up as it is in Marton Mills' worsted wool, Birds Eye fabric. This is acoustically transparent, and resistant to dirt, water and 'unnecessary' wear and tear, whatever that means. If you are after a speaker with the tiny footprint and 360º audio of the UE Megaboom 3, but more refined sound and less ruggedised looks (not that the Megaboom is unattractive), look no further than Bose's Soundlink Revolve. For its size, this is a superb sounding speaker, and Bose's excellent app makes it easy to pair two into a stereo duo. Audio quality is high and portability is exemplary although unlike the Ultimate Ears speaker, this is not waterproof, so don't chuck it in your hot tub. This speaker is badged as a Marshall, but obviously it doesn't come direct from the same sweat-stained factories as its legendary guitar amps. But it still rocks, and this Mk 2 model is notably better than the (excellent) first Kilburn in terms of both sound and looks. Audio is loud and proud, rich and powerful with plenty of bass, and cleverly processed with a strong 'faux-analogue' sound. Built as a compact speaker for small to medium rooms, it is nonetheless still battery-powered, and portable via a natty strap. Pairing is swift and the audio, while coloured so as to sound 'rocky', can be tweaked all over the place using the old-skool bass and treble tone knobs. The looks might still not be to non-rockers' tastes, but Marshall has toned down the 'heavy metal' styling in recent years, and this sits quite happily in any home that isn't overloaded with chintz. The audio is still not what you'd call subtle, but there's little to beat the Marshall Kilburn for sheer room-filling oomph. The addition of basic splash- and moisture-resistance makes it suitable for bathroom use, so long as you don't leave it too near the bath. It's part of a range of excellent Marshall Bluetooth speakers and also, nowadays, some excellent multi-room Wi-Fi speakers. If you want a rather more serious Marshall-badged speaker in your rockin' home, this is probably the one to go for. The Stanmore II Voice takes the musical virtues of the KIlburn II but loses battery power and a bit of moisture proofing. Instead what you get is a very stylish, plug-in speaker with 80 combined Watts of power (2x 15W plus a 50W woofer) and Alexa built in. It is a little bit of a faff setting it up, and once that's done you have to press a button every time you want to pair it, or it defaults to a Wi-Fi setting that as far as I can see, is only needed for the aforementioned setup. However, maybe you don't need to pair it. That's because Alexa, used in conjunction with Amazon Music or Spotify (with other services to follow now Amazon has opened up Alexa to third parties), makes for a great audio experience on the Stanmore II. Nobody is going to mistake it for audiophile sound, but being able to order up any tune in the world, and have it blasted out, is highly enjoyable. Eventually, Marshall reckons Amazon will also allow third-party speakers to use its multi-room system, but we'll see about that. Even if you don't have Amazon Music or Spotify, Alexa's usual bag of tricks and Skills is on hand, and it's excellent as an apt-X Bluetooth speaker, too. If you only want to use it as a Bluetooth speaker, you're better off with the vanilla, Alexa-less version of the Stanmore II.. If you decide the Cambridge Audio YoYo (M) is both too stupidly named, and too much of a pain to setup, this excellent offering offers full stereo, without the need to pair two speakers, as they're wired together. With a 3.5mm input and an optical digital one and an output for an active subwoofer, this could be the basis of a neat little system, but it's also mighty fine as a Bluetooth-only setup. Audio is in line with most Ruark products, in that it's more Manilow than Metallica; more Stone Roses than Stormzy. But that's fine. In my opinion, the more upfront sound of the Cambridge Audio YoYo (M) is better – and it's cheaper too – but I know loads of older folks and acoustic heads love the Ruark sound. The fact the speakers are wired to each other does make setup less of a hassle, as it removes the need to turn on two speakers every time you want to listen to music. It does limit how far apart you can place them, but you could always buy a longer 3.5mm to 3.5mm cable. • Hey, why not add a turntable while you're at it? Rather brilliantly, you can also currently buy the MR1 Mk II with a Rega P1 (plus a Fono turntable pre-amp) for £659, or upgrade to a Rega P2 for £789. As you can see, they make an exceedingly handsome couple – and let me tell you, readers, they're a couple who make sweet music together. Mmm-mm. This is a slightly curious device, in that it looks like a perfect portable speaker, for taking on the road with you, clipped to your napsack. However, it is not water resistant, and too beautiful to fling about, so if you do take it on the road, I'd advise treating it ever so carefully. However, this list is primarily about getting the best sound from Bluetooth speakers and in that department the Andiamo delivers. The volume, quality and bass extension of what it produces is almost like witchcraft, when you consider how small it is. Sure, there are no play/skip/pause controls on the speaker (volume only), and you have to charge it via a proprietary charger rather than USB. Even despite those failings, if you're after a superb-sounding speaker that you can carry from room to room and, rather gingerly, at a push, out of the house, this is a stellar option. This one sits around the midpoint between the booming Marshall and the more audiophile KEF, but is cheaper than both having reduced in price quite somewhat since its launch. Presumably that's because it looks quite bad but I can assure you the audio is fantastic for 100 or so quid, and you can always hide it behind an ornament, right? Monitor Audio's wonky funnel of a speaker is also highly portable. However, despite having a USB input that I initially assumed was for charging its batteries – oops – the S150 turned out to actually be mains powered only. The look is just not great, let's be honest, especially in the gold finish. Other than that, it's an impeccable Bluetooth speaker and at the price you can get it for these days a solid faux-gold DEAL. The sound quality, bolstered by Apt-X/AAC, is truly excellent for the price, and pairing is easy. A fantastically good looking, compact speaker for the audiophile set, the Muo from KEF sets out to provide 'audiophile' grade sound from an ultra-compact enclosure. It largely succeeds in this aim, which means it's very easy to listen to for extended periods, but lacks the bass extension to 'blow up your crib'. For those who do not require rib-shaking bottom end or hard-rockin' volume, this should be just fine. It is also a fantastically stylish bit of metal engineering and ever-so-easy to carry around, although I wouldn't recommend going anywhere remotely wet with it. The great thing about Bluetooth is that it is compatible with just about everything short of your garden shears. Pairing is easier than with Wi-Fi-based wireless speakers, too. It's simple, quick and practically always painless, these days. It's also platform agnostic. Google Music, Apple Music, Spotify, Tidal… It makes no odds. This is a very diverse branch of tech, so there are also picks at different price points and for different musical styles and settings. And let me tell you, readers, the number of truly dreadful Bluetooth speakers you have to listen to, in order to pick out the 10 best ones, is quite something. If you want something like CD-quality audio from Bluetooth, you should opt for a speaker with support for the aptX and AAC codecs. However, while Apple mobile devices don't support Apt-X, and many speakers don't incorporate AAC, which Apple does support, it's perfectly possible to get decent sound via standard Bluetooth (also known as SBC) from an iPhone. You can draw your own conclusions from that, but I feel that the inherent audio limitations of Bluetooth speakers actually tend to mask rather than emphasise imperfections in the source material. They don't give a true 'hi-fi' sound, but they do give an enjoyable one. The overall audio quality of Bluetooth speakers seems much more influenced by how well they process and amplify your music files, than the state they arrive in, so long as they're reasonably high bitrate (obviously, rubbish in, rubbish out). Despite not being hi-res or even CD quality most of the time, when put through a speaker made with skill, and top-drawer components, music beamed via Bluetooth can sound great. AAC and aptX definitely can help it sound even better, but they're not the be and end all of good audio quality. Qualcomm now offers something called aptX HD – as you'd imagine, this offers even better than CD quality sound. With the right speaker and source this can sound rather spectacular – the Alva TT wireless record player found in our best record players chart, going to the stunning, aptX HD compatible Naim Uniti Atom for instance. Some other issues to be aware of: you'll probably want to take your phone out of your pocket for uninterrupted streaming – your body can block the signal if you're moving around. And if someone calls you on your phone while you're streaming from it, the music is gonna stop. There's no way around that with Bluetooth, although on the plus side, some of these speakers do double as speaker phones. The speakers listed above in our Top 10 are the best Bluetooth speakers for phones, tablets, PCs and Macs that money can buy. Pricing is from about £100, because to be honest, if you want seriously good sound quality, you won't find it at a sub-£100 RRP.